Bereavement, especially the loss of spouse, has a severe impact on the psychological and social well-being of women. Loss of spouse has a strong impact on their personal and social adjustment, health, and life satisfaction. In the Indian social scenario, where widows are excluded from full participation in society and have to perform many rituals, the condition of widows becomes all the more miserable. The upliftment of widows is one of the priority areas under women empowerment for both governmental and social agencies. In such a scenario, to understand the psycho-dynamics of widowhood is of great importance. The present book is an attempt in this direction with special focus on middle aged educated widows, a relatively less attended section of widows. An attempt is made to see the effect of widowhood on repression-sensitisation tendency, ways of coping, mental health, and personal adjustment. 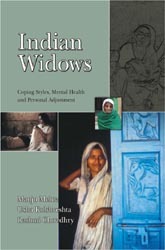 The book also includes a research study to narrate the effects, scientifically, on working as well as non-working widows. An effort is being made to compare working and non-working married women. The book provides some valuable hints for social planners and policy makers for developing strategies and tactics for helping widows in their readjustment. It is useful for counselors, family members, well-wishers and all those who are concerned with the welfare and upliftment of widows.